ORANGE, CALIFORNIA, USA September 2017. 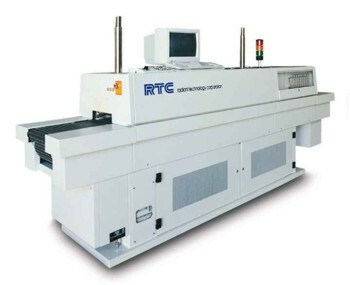 We currently have an exceptional refurbished RTC LA-306. This singular furnace is configured with an extra long exit entension adding 30 inches to the product Unload station and to the overall length of the furnace. The furnace chamber includes brand new insulation for 1000C operation, new plenums for CDA, nitrogen or forming gas operation. Manufactured out of aircraft aluminum, the CACT cooling tunnel is also brand new. 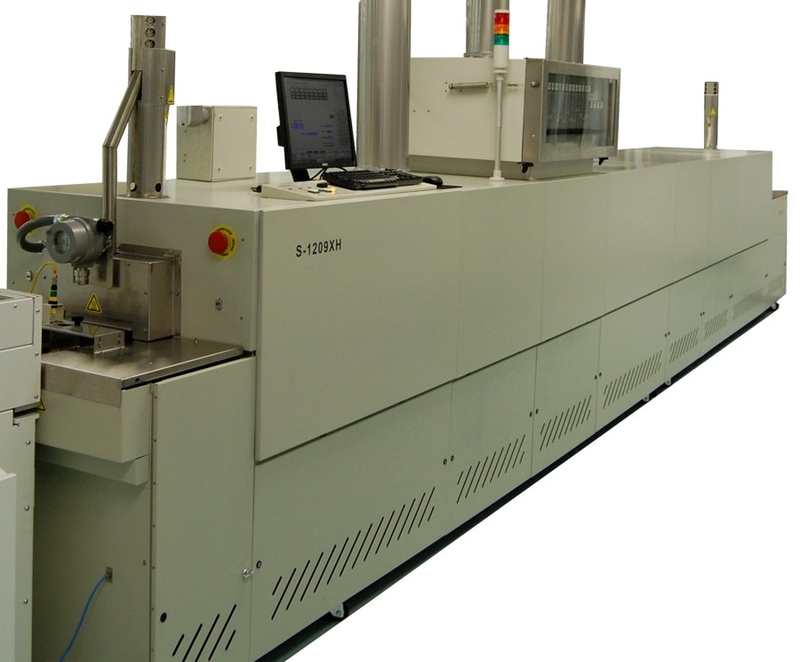 Perfect for thick film, annealing, solder reflow and dental lab applications. 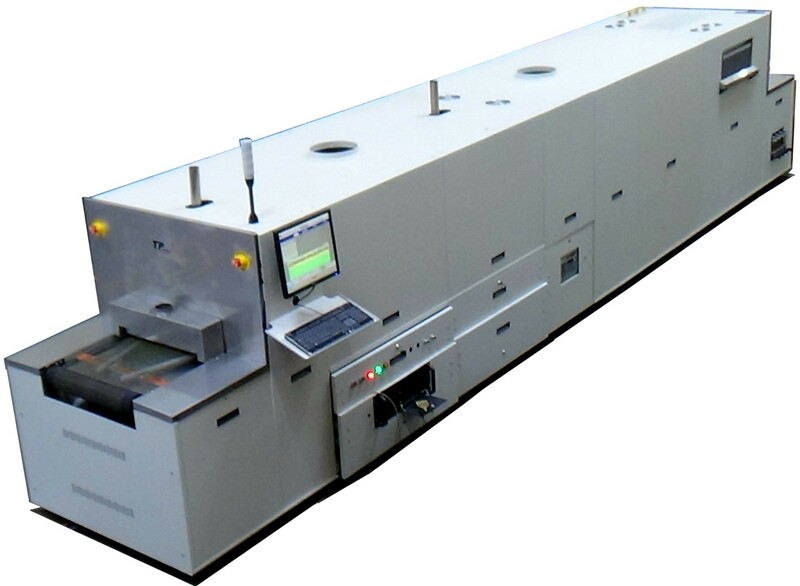 We have one 4-zone RTC LA-310 production / lab processing furnace left. 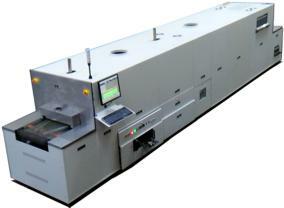 Call or email us for technical details on these furnaces. Newly manufactured in 2015 for a special project, this furnace features the TPS split casing design which allows the top of the heating chamber to be raised above the chamber bottom by wired remote while the furnace is down for maintenance. This 1000C furnace was designed for low oxygen processing with a 3-port sampling system and built-in Illinois Instruments EC-913 analyzer system for sampling furnace chamber gas. One extra port is provided for use of a auxiliary analyzer (aux analyzer and sample pump by owner). Connect up to 3 process gases simultaneously. The PLC control system is designed for computer switching between combinations of CDA, Nitrogen and Forming Gas (FG<4.5% Hydrogen). Furnace chamber has 2" clearance height above the 18" wide belt. Heating chamber is 4-zone, 60 inches long. The furnace has 90 inches of water cooling followed by fan cooling section. The furnace chamber has 4 quartz ports in the top of each zone for a IR temperature measureing devices. (c)2007-2019 Lochaber Cornwall, Inc. All Rights Reserved. RTC Radiant Technology Corporation is a trademark of BTU International, Inc.